The anthem would top German pop charts for the next two months and become the soundtrack for the peaceful reunification of East and West Germany. Nearly 25 years later, Hasselhoff is back in Berlin with a new goal: preventing a portion of the wall from being destroyed in the name of development. 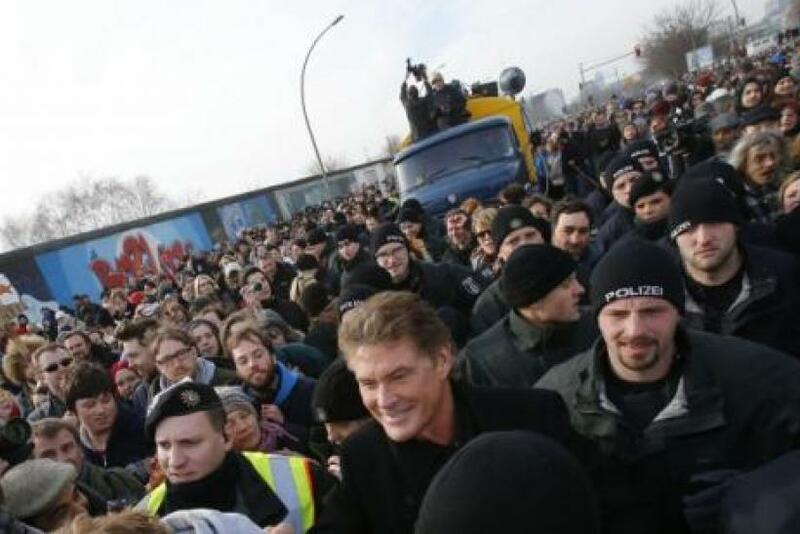 Hasselhoff, whose name carries far more weight in Germany than in his homeland, joined thousands of Berliners Sunday in protesting a real estate developer’s plan to remove the East Side Gallery to make way for an access path leading to new luxury housing. The East Side Gallery is the longest remaining section of the once-hated concrete barrier dividing East and West Germany. The 1.3 kilometer (0.8 mile) stretch is now covered in colorful murals, including the famous Fraternal Kiss, depicting Soviet leader Leonid Brezhnev and Erich Honecker, his East German counterpart. Protesters formed a human chain around the wall earlier this month before Berlin’s mayor brokered a compromise last week. The demonstration Sunday was designed to keep pressure on developers and city officials and prevent them from steamrolling Berlin’s tumultuous history to make way for new developments. At least 136 people died trying to cross the wall between 1961 and 1989. Most of it was removed thereafter, with large sections sold to museums and smaller fragments packaged as souvenirs for tourists. Presently, just two sections remain as memorials, with the Bernauer Strasse section in the city’s north now acting as an exhibition about city life in the time of the Berlin Wall.